I'm pretty smart (so I think)....Well, this game challenged me. My 9 year old had to remind me that 2 is a prime number. 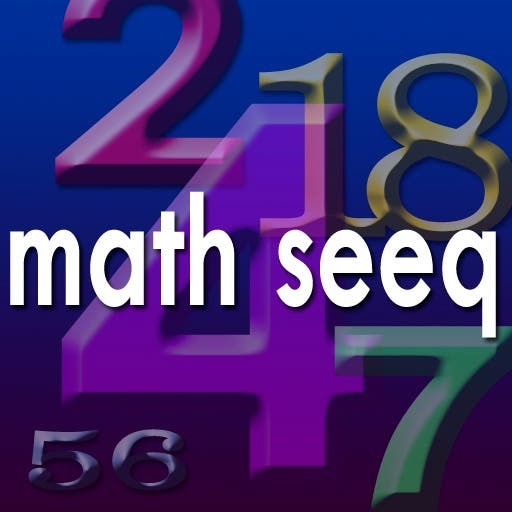 Math Seeq is a fun educational app that you can give to your kids to help them improve on their math skills or turn them into a code breaker - think (Audrey Tatou in DaVinci Code with the Fibonacci sequence). After selecting your game level, Math Seeq tells you what mathematical sequence you are following and gives you a hint on what the first one or two correct answers will be. 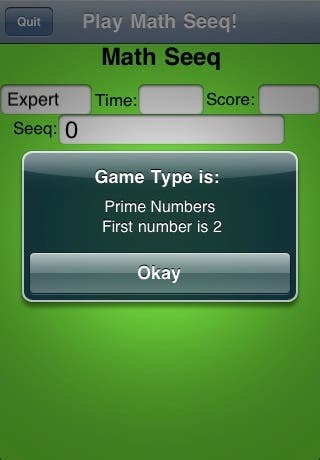 You have to find and tap the next correct number in the sequence from a bunch of numbers flying around the screen. (see the video below) The first level is pretty easy, starting out with sequential numbers; one, two, three etc. You get to tap as many numbers in the sequence as possible during a set time period. The first level then goes on to challenge you with all the sequences in the basic times tables; multiples of two, multiples of three and so on up through nine. Math Seeq can challenge every age. The grade schoolers can practice their times tables and the more complex stuff will challenge older kids and serve as a good refresher for us adults - trying to keep the brain exercised (Alzheimers!) For correct answers you get points, and you get additional time for each correct answer as well. High scores are saved so you can keep track of your progress. There are plenty of ways to practice your times tables out there, but here you have to hunt them down and tap them! Math Seeq is fun to play and it's addictive! Sometimes the number you are looking for gets hidden behind another number and you have to wait for it to escape before you can nail it, but that just adds to the fun. Bottom Line - Worth downloading the full version for kids or adults. I give it 8/10 iPhones. ~T. Posted from BlogPress - Please excuse the formatting.